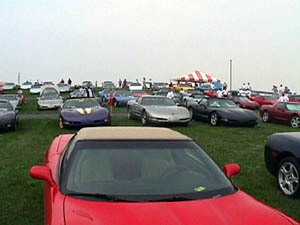 The C5 Registry was lucky enough to be given the 'HILL' overlooking the famous Carlisle Fairgrounds, for "Corvettes of Carlisle." 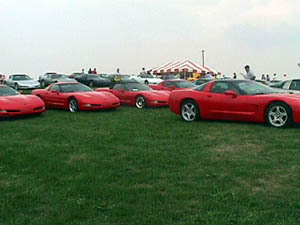 The following are some shots of the gathering of the C5 Registry members as we make our presence known in the World of Corvettes. The 'HILL' turned out to be a great spot. We filled it with more than 100 C5's each day. And we were definitely the largest group there. We had refreshments provided each day by Steve Moore Chevrolet and Bud's Chevrolet. We served of over 600 hot dogs and 800 sodas in the C5 Registry tent. "The C5 Registry gathers for an all out assault on Carlisle." 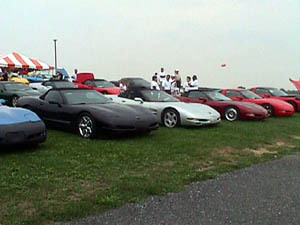 "The C5 Registry takes the 'HILL' at Carlisle." "The socializing begins on the 'HILL'." 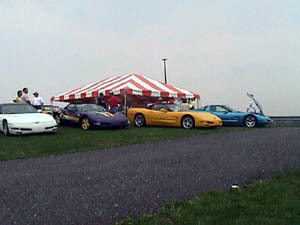 "Some of the more colorful C5's there! Is that a new Millennium Yellow C5?